I've done work with the Field Museum in Chicago to teach Boy Scouts about archaeology for their Archaeology Merit Badge, and one thing we do is practice labeling objects that we find. I always tell them that this is one of the most important parts when you are on a dig so that archaeologists can go back and tell where something was found-because after you move it, you can never put it back in the exact same place. In Ashkelon, we record the location of four major things-pottery, bones, material cultures, and soil samples (so they can check for plants/seeds/food remains). I asked one of our square supervisors, Rebecca, to explain what actually goes on the tag when something is found. After the tag is made, they go through with our Geographic Information System (GIS) team to record the exact location it was found in the grid and mark it on the map of our grid. Today is the first day I've been back in the field and it is so interesting to see how the grid has changed in the two weeks since the season started! At the end of last year, we were just beginning to reach the 604 BC destruction layer when the city was burned down by a Babylonian king, Nebuchadnezzar. There are parts of the grid that have different time periods exposed, so I asked Maddie, one of our senior volunteers, to explain one of the cross sections of a floor. You will see different markers on the wall that tell the supervisors which time periods they are looking at so they can correctly log what they find, and in this section, you will see a layer from 604 BC up to the early Persian period between 538-332 BC. What did the people in ancient Ashkelon eat? Dr. Deirdre Fulton, one of Ashkelon's zooarchaeologists, is here to tell you about what people in ancient Ashkelon used to eat. Does where you live determine what foods you eat? In America we are very lucky because food is shipped from all over the world when it is not in season, but do all countries have this same option? Look in your fridge and research where your fruits, vegetables, and meats came from. Many of them have where they are from on their stickers and are grown in warmer climates. Compare these fruits, vegetables, and livestock to what is grown in your area-how do they compare? Both Dr. Tracy Hoffman and I have been speaking with Biblical Archaeology Review throughout our time on the dig to give updates to their readers. We let them know how we were preparing for the trip, what we were finding, and the outcome of our dig season. Click here to see my most recent article! You can also go through the rest of the field notes to see Dr. Hoffman's updates and how I prepared for my trip before leaving to Israel. Who is who on the dig? On the Ashkelon dig, we have many different people who come to help. Specialists, volunteers, supervisors, and I all work together to excavate and answer questions we have about Ashkelon in the past. Watch the video here that explains what all the jobs are! One of the dig specialists, Dr. Sherry Fox, recently took the time to Skype in with me from Greece to talk about what she studies-human bones! Watch the video below to see her explain how she is able to tell the gender, diet, and age of the person while they were alive. What else do you think scientists look at around where they find human bones? What other clues that are near the person may give scientists a hint of what was important to that culture? Look at the different types of meats you may have in the freezer at your house (or at the grocery store) and compare the bones that you see. Can the bones give you hints of what part of the animal that the meat cut comes from? What do the different bones have in common, and how are they different? Do you think that you would be able to identify what type of animal it came from by just looking at the bone? It is very fitting that the last stop of our learning tour was Megiddo, a word that means Armageddon in Greek (Armageddon is the battle in the Bible during the end times). Megiddo is an extremely large tel where 26 layers have been unearthed. It was an extremely important city-state that guarded the narrow strip of land that was the trade route between Assyria and Egypt. People lived in Megiddo from 7000 BCE until 586 BCE, and excavators found a temple here used in the Early Bronze Age that was the biggest and most monumental edifice (system of religious beliefs) of its time in all of the middle east. The site started to excavated by the University of Chicago (along with the Oriental Institute in Chicago) in 1925 and was funded by John D. Rockefeller (have you heard of Rockefeller center in New York? That was named after his family) until World War II. The site began to be excavated again during the 1960s and ever since 1994. We even have some of our volunteers stay here to help dig for their last week since we were not able to return to Ashkelon! Go through your logbook and look at all of the notes you have made during the summer. What was the most interesting thing you learned? Do you still have any questions about archaeology that aren't answered on our site? What job might you want to do on a dig site? Email your answers to me at teachashkelon@gmail.com and I will post some of the responses I get! Why do you think that the Greek name for this site means "Armageddon"? What about the site might have led them to call them that? Bet Alpha is a synagogue with a beautiful mosaic floor built in the 6th century (500-599 CE). In the 1920's, members of a local community were digging an irrigation system and found the floor. It was excavated until the mid-1960s and was soon after turned into a national park. In the middle of the floor is a zodiac (you can see a better picture of it here). Have you ever seen a zodiac before? You can see another picture of one here that shows a constellation zodiac. Zodiacs show different times during the year and are based on how Earth moves around the sun. 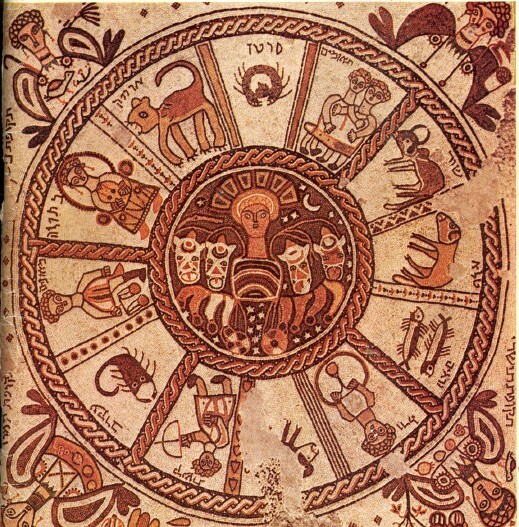 The zodiac at Bet Alpha represents the different seasons of agriculture (growing crops) during the year. When you have seen a zodiac before? Have you seen it in places like a Chinese restaurant or when people talk about their horoscope? Are all of the zodiacs are the same or different? Why do you think they put the zodiac on the floor instead of the wall, and why did they just not paint it? Arbel is a really cool place because fortresses have been built into the actual face of the cliff so it was harder to attack. These natural caves were used by rebels against King Herod and fortified during the Roman period. Below, we were able to see the Roman, Byzantine, and Hellenistic period village ruins-there was a lot of history there! Taking a break from our trip, I thought I would post some pictures from back in Ashkelon. The week before I left, I had the chance to go with Ben, a geoarchaeologist to the beach of the Mediterranean Sea (our dig site was only about 50 yards from the beach, it was pretty great). While there, he explained how the sea has caused erosion over time to the beach front. To prevent this, jetties were put in to stop some of the fast moving water (click here to see a picture of a jetty)-but in doing this, the deposition levels of different areas has changed. I know my 6th grade class has looked at how this happens and have designed ways to slow erosion on beaches. Think about a time that you have been to a beach-is the level of sand and rocks the same all across it? What other ways can you think of to stop the erosion of sand and rocks from beaches besides just putting a wall up? Watch this video as Ben explains erosion, then check out the pictures below. One man made way of slowing rock erosion is to reuse ancient Roman columns and lay them down under walls. This stops the water from washing away rock layers because the columns break the waves! Draw in your log book other ways you can think of to stop water from eroding the seashore. What positive and negatives might your addition change on the beach? What do you think the beach front will look like after you add your addition? Day 2 of the learning tour ended at Belvoir, a Crusader fortress. It was used from 1168-1189 when it was lost in battle to Saladin and his Muslim forces. The ruler of Damascus destroyed the fortress in 1220 so that the Crusaders could not come back to it and use it for fortification again. It wasn't until the 1700s that an Arab village, Kaukab el-Hawa was built on top of the ruins, but it lasted until 1948 before being destroyed again in the War of Independence. Check out the awesome moat around the fortress. You could walk around in it! View of Jordan from the highest part of the fortress. Alright, so let me start this post by saying that Bet She'an was probably one of the coolest archaeological sites I've ever been to. I love learning about Roman history, and this ancient city has left tons of Roman artifacts behind-largely in tact. I know many volunteers and I agreed that this was one of the favorite sites we visited, even in the 112 degree heat. Bet She'an was built in the fifth millennium BCE. During the Late Canaanite period, the city was ruled by the Egyptians. After a battle, King David took the city (along with Migiddo, which you will read about later on) and it became a major center during King Soloman's reign until it was destroyed in 732 BCE. After, the city of Nysa-Scythopolis was built on top. This happened very often in history, and is what the word "tel" refers to-cities built upon cities. During the second century BCE, the city was mostly populated by a Jewish population until 63 BCE when the Romans conquered it. It was one of the ten cities of the Decapolis, and it became one of the most important cities in Northern Israel. In the Byzantine period, Bet She'an became mostly Christian, and the population reached as high as 30,000 to 40,000. A major earthquake hit the city in 749 CE and ruined most of buildings. The city was largely forgotten about and a small city, Beisan, was built on top. Bet She'an started to be excavated in the 1920's with most of the major renovations being carried out in the mid 1980's. You will also note a famous tree pictured below that was featured in the last scene of Jesus Christ, Superstar. Take your logbook with you to any shopping area in your town. Create a map showing all of the businesses that are there-what do you see? In Bet She'an, there was a theater, market, and places to worship. Do you see any of these things? What do these places tell you about how people in the area live? Do you think that all of the cities that we have seen in Israel have had this same layout? Why or why not? Why do you think that cities like this show us in more detail the way that people lived during this time period than others? I was able to safely get back to America with a heavy heart that I had to leave Israel early. I was so impressed with the people in charge of the dig and their level of organization throughout our move around the country. I'm used to being in charge of my class, but our coordinators were in charge of about 70 people's travel arrangements, hotel bookings, and food. I'm lucky to be part of such a well organized dig. With that being said, I will continue with my blog throughout the summer telling of the sites we were able to visit on our field trip around the country since they were so interesting. Third up on tour was Tel Hatzor. The tel was the site of a major city from about 1750 to 900 BCE (before common era, the more commonly used term than BC). It was one of the largest in the region and located in the fertile crescent, an area that was very good at growing crops. It is located north of the Sea of Galilee and has been largely reconstructed by different archaeological groups. The second stop on our study tour was Nimrod's Fortress. It was built during the sixth crusade and was used as a place for security during an attack on Damascus and was added to throughout the 1200's. After the crusade, it was used by many other groups for things such as a prison for exiled nobles. We had a great time as Dennis explained the history of the fortress to us, and even more fun going down the "secret stairways" that wound throughout the different towers. We also had some great views of the valley below from the tall towers the fortress supplied! There may not be a post tomorrow-I will be traveling home from Tel-Aviv and may not have internet access. There will be more posts to come once I land in Chicago! Taking our group up north! We’ve had to take our dig up North because of trouble happening in Ashkelon. I will be starting my blog from today on showing you some of the places we visit on our archaeological field trips and tell you the history behind them! First up on our stop was Tel Dan. Tel Dan is one of the most northern cities in Israel, and is mentioned in the Bible. It has one of the oldest and most in-tact gates (we also have one at Ashkelon, watch the video here!) and was used throughout the Bronze age, Iron age, Hellenistic, and Roman periods. We got the chance to hike to the gate and walk around to an alter where they made animal sacrifices. Our dig's zoo-archaeologist, Deirdre, told us all about the animals they have found here--which included 2 lions! Did you know that every time we work in a new area in our grid, its coordinates are read so we can make 3D maps? Grant, Grid 51's GIS worker (GIS stands for geographic information systems) will show you how the readings work. Do you see Joel holding the red and white stick? That is the location we are taking a measurement of. For every area, we take a reading when we go down a level in time. This means that even though it is the same space, we could take multiple coordinates so we know how high each level is when a new time period starts. These levels can then be matched up with buckets of pottery we collect or with specific artifacts we find. Taking the GIS coordinates for the location and elevation helps us see patterns when we find artifacts, even if we are not digging in the same level across our grid. This can help us determine what that space was used for and what it used to look like. I will be posting a module soon on triangulation and GIS coordinates, so make sure to check back on our modules page if you want to learn more. Look at different objects around your house that have different heights. What would you use to measure them? A ruler? A yardstick? Use your log book to record how tall at least 5 objects are and what tool you used to measure them. Why do you think that archaeologists don't just measure how high things are in the field? What could be the problem with just measuring how high a wall is or how deep down a well goes? One of the people who works on the dig, Bridgett, recently had the chance to tell me about her work with the soil samples she collects from different dig sites. Bridgett is the one who we call in if we see the ground is a funny color and we want to know what happened to it in the past. She is able to put the samples in an infrared spectrometer and read the levels of all the elements to tell us what it is. It is very useful in finding out if a fire occurred there, if the spot was used for cooking, or if there are parts of bone in the soil. Knowing this information can tell us what that space was used for and help us piece together the clues of what the different rooms are that we excavate. Check out her video below to hear more! If you are interested in learning more about infrared light and carbon dating, head over to our modules page to see our lesson. Ask a parent to find 3 different white powders from your kitchen or spice cabinet and make small piles of them on a plate without telling you what they are. In your log book, record all of their properties (what you can see) and make note of how they are different. Next, brainstorm a way to run tests to see what the different powders are. Is there any liquids you could drop on the powders to solve the mystery? How else could you tell what these powders are than just asking your parent to tell you? Why do you think it would be important for scientists to know what was located in different areas? Do you think that the areas were always used for the same thing? For many of our volunteers and staff, we spend the majority of the summer in Israel working on the dig. Some supervisors are away as long as 2 months! They spend time preparing the dig sites, setting up a game plan of what they would like to dig, dig, then get everything put away and stored so they can study it when they go home. To feel like home for a little bit, one of the girls who comes along on our dig every year (her dad is the dig coordinator) plans a 4th of July party! We had a great time playing cards by the pool, eating cookies, and relaxing. It was great after our long day digging! Every year, the supervisors put together a finds presentation of some of the neat artifacts they have dug up in their grid. We recently had the presentation which included items found from the end of the 2013 season and the beginning of the 2014 season. Check out some of the pictures to see if you can recognize any of the objects! The supervisors and volunteers of Grid 51.